A British mum faces being jailed in Dubai over a disparaging Facebook post she made two years ago about her ex-husband's new wife. Laleh Sharavesh was arrested along with her 14-year-old daughter Paris when she arrived in the Arab kingdom for her ex's funeral last month. She discovered her ex-husband's second wife had complained about the social media post from 2016 and Laleh was held under Dubai's strict cyber crime laws. 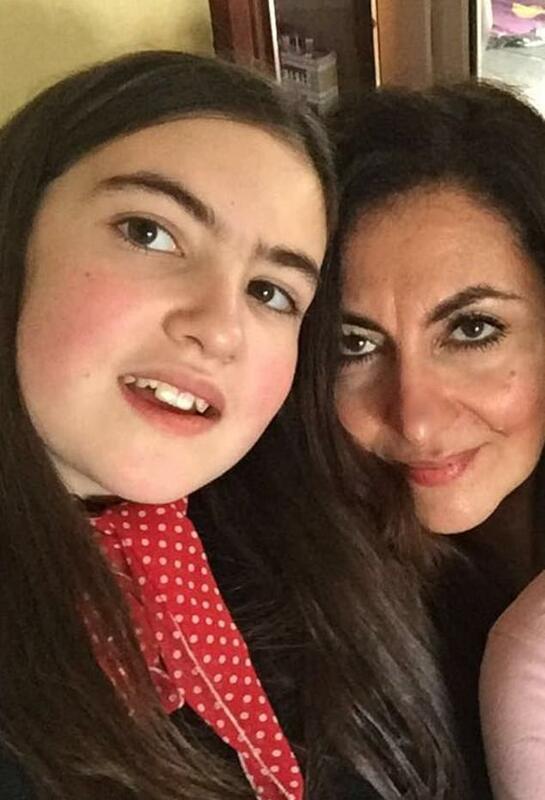 While her 14-year-old daughter was allowed to return home to Britain, Laleh, 55, has been banned from leaving the country as her passport has been confiscated. Lawyers have told the single mum she faces up to two years in jail and a fine of £50,000 when she appears in court later this week. Laleh told Mail Online: 'I am terrified. I can't sleep or eat. I have gone down two dress sizes because of the stress. And my daughter cries herself to sleep every night. We are so close, especially since her father left us and we only have each other. It breaks my heart to be kept apart from her'. Her ordeal began on March 14 when Laleh and her daughter flew to Dubai's for her ex husband Pedro's funeral. He died aged 51 from a heart attack on March 3 and Laleh and her daughter, from Richmond upon Thames, Surrey, wanted to pay their final respects. Two years earlier after the Portugese banker had left her after 18 years of marriage for a younger woman she lashed out in anger on his Facebook page when she saw a photo of his new wife on their wedding day. Laleh said she wrote two comments in Farsi where she described 42-year-old Tunisian born Samah al Hammadi as a 'horse' and called her ex an 'idiot'. As she made the Facebook post while living in the UK she thought nothing more about the comments. She was unaware al Hammadi had complained to Dubai authorities where social media posts can be used in a prosecution. Laleh said: 'I had no idea he was getting married again, and so soon after our own marriage broke down. 'I reacted badly. I lashed out and wrote two unpleasant comments about his new wife on his Facebook page. 'I know shouldn't have. I should have behaved better, but I felt angry, betrayed and hurt. After 18 years of marriage, such a small amount of time apart, he was getting married so quickly. He didn't even have enough respect for me to tell me in advance'. Laleh said she was offered a statement to sign in Arabic and the translation of the Facebook post bore no relation to what she had written. Laleh was told she could not leave Dubai while she awaited a court hearing. Her daughter was allowed to fly home and is desperately missing her mother while she stays with friends. Laleh lived in Dubai for eight months with her husband after he landed a job with the HSBC bank. She returned home with their daughter expecting her husband to return after he completed his work commitments. But she later discovered he had begun a relationship with another woman and filed for divorce after 18 years. Laleh said she had no idea her husband planned to marry so soon after their split. Her husband and his new wife Samah Al Hammadi were living in Dubai when the Facebook posts were made in October 2016. Laleh said she has lost her job at a homeless shelter due to her absence and now faces losing her home as she has racked £5,000 in debt while being forced to stay in Dubai. She said: 'I have lost everything because of this. 'I have no money left after paying to stay in a hotel here for over a month. I have lost my job and am unable to pay for rent on the flat I live in with Paris, because of this we are about to lose the flat. 'I am even in debt to my family for over £5,000. My life is in ruins, and that is even before the huge fines and jail I am facing here. All of that is less important than being separated from my daughter, and that's all I want now, just to be back with her'. Laleh's sister Laden said the family appealed to the British Embassy for help but were told they could not intervene. She said: 'I have spoken with Laleh, her mother, sisters and daughter Paris. Their experience is heartbreaking. 'Not only has Paris lost her father, but in going to visit him to say her final goodbye, she wound up in a frightening Middle Eastern police station, and is now without her mother. 'Paris is writing a letter to Sheikh Mohammed, the ruler of Dubai and Prime Minister of the UAE to appeal for her mother's release. I also call on Sheikh Mohammed to ensure Laleh is swiftly reunited with her daughter in London and to review the content and application of the UAE's cybercrime laws. I also call on Laleh's MP Zac Goldsmith and Jeremy Hunt to enter into diplomatic discussions with the UAE to ensure Laleh's safe return. Sterling said the UAE have draconian cyber crime laws that can be enforced at any time. 'The UAE is the most likely place for British nationals to be arrested abroad and the Cybercrime laws have potentially rendered almost every visitor a criminal. 'The laws are enforced arbitrarily, which leads to even greater confusion over what is or isn't a crime. 'I have warned the British Foreign and Commonwealth Office that their advice to tourists is insufficient. 'When the UAE introduced Cybercrime laws, it rendered almost every visitor to the country a criminal. 'Visitors to Dubai are rightfully unaware that they could be jailed for a Facebook or Twitter post made from outside the jurisdiction of the UAE, and made years ago. The UAE's cybercrime laws apply extraterritorially and retroactively. The Cybercrime laws prohibit sharing charities online such as Amnesty international, they prohibit fundraising, sharing photos taken in public, for example that includes a vehicle or other people.